Reading and share top 10 famous quotes and sayings about New Frontiers by famous authors and people. Browse top 10 famous quotes and sayings about New Frontiers by most favorite authors. 1. "The struggle to emerge out of the past, clean of memories; the inadequacy of our hearts to cut life into separate and final portions; the pain of this constant ambivalence and interrelation of emotions; the hunger for frontiers against which we might learn as upon closed doors before we proceed forward; the struggle against diffusion, new beginnings, against finality in acts without finality or end, in our cursedly repercussive being.."
2. 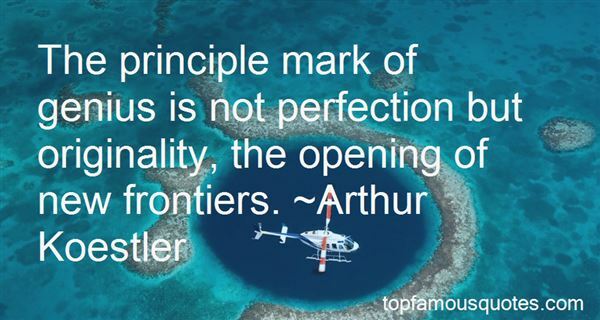 "The principle mark of genius is not perfection but originality, the opening of new frontiers." 3. "The planet's hope and salvation lies in the adoption of revolutionary new knowledge being revealed at the frontiers of science." 4. 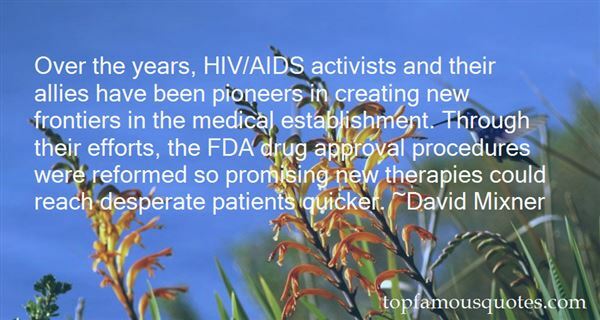 "Over the years, HIV/AIDS activists and their allies have been pioneers in creating new frontiers in the medical establishment. Through their efforts, the FDA drug approval procedures were reformed so promising new therapies could reach desperate patients quicker." 5. "By the time of the arrival of Islam in the early seventeenth century CE, what we now call the Middle East was divided between the Persian and Byzantine empires. But with the spread of this new religion from Arabia, a powerful empire emerged, and with it a flourishing civilization and a glorious golden age.Given how far back it stretches in time, the history of the region -- and even of Iraq itself -- is too big a canvas for me to paint. Instead, what I hope to do in this book is take on the nonetheless ambitious task of sharing with you a remarkable story; one of an age in which great geniuses pushed the frontiers of knowledge to such an extent that their work shaped civilizations to this day." 6. "There are no pat answers - we're pushing through some new frontiers, and lessons of the past don't always apply." 7. "Neither the fanatics nor the faint-hearted are needed. And our duty as a Party is not to our Party alone, but to the nation, and, indeed, to all mankind. Our duty is not merely the preservation of political power but the preservation of peace and freedom.So let us not be petty when our cause is so great. Let us not quarrel amongst ourselves when our Nation's future is at stake.Let us stand together with renewed confidence in our cause -- united in our heritage of the past and our hopes for the future -- and determined that this land we love shall lead all mankind into new frontiers of peace and abundance." 8. "Melissa McCarthy just opened this new movie, 'Identity Thief,' and Rex Reed, who's a known critic, wrote a scathing commentary on her weight. I think that weight designation is one of the last frontiers of bullying. I don't know what the right 'ism' for it is, but I think that there's a level of that that's happening that's certainly not okay." 9. "One reason citizens, politicians and university donors sometimes lack confidence in the social sciences is that social scientists too often miss the chance to declare victory and move on to new frontiers." 10. 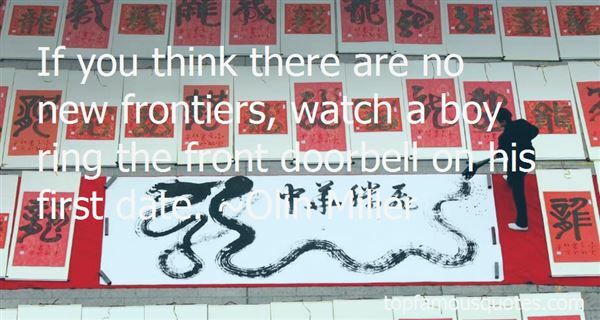 "If you think there are no new frontiers, watch a boy ring the front doorbell on his first date." I've been told that I have a lot of energy. The secret is that I use renewable resources. Some days I'm solar powered. Some days I'm wind powered. And some people in this room might think I'm hybrid gas-powered. You'll just have to guess which it is today."